School is beginning this month and, with it, comes a transition from a relaxed summer routine to a new, more rigid (and familiar) school routine. Soon enough, students of all ages will getting up early, attending classes, going to sports, music, and extracurricular activity practices, coming home, eating dinner, and doing homework. It’s a full day that hasn’t even included video game playing, TV watching, or social media interaction! Repeating this new routine over and over can leave students tired and exhausted before the month of September has come to a close. Tired and exhausted is not a healthy way for students to live their lives. Safeguards must be established to prevent illnesses from setting in. The most important of these is sleep. Students must ensure that they get plenty of it. As we suggested in Why The Lack of Sleep Is Hurting Your Child, insufficient sleep leads to breakdowns in attentiveness, memory, immunity, and mental and physical health. Not getting enough sleep leads us to our secondary topic: mononucleosis, otherwise known as mono. Mono is an illness that’s caused by the Epstein-Barr virus. It’s very rarely a serious illness but the symptoms may make you wish you never contracted it. One way to prevent or manage symptoms of mono is to make sure that you get plenty of sleep! Those who have a weakened immune system are susceptible to mono. How Do People Contract Mono? The Epstein-Barr virus that causes mono is typically spread through saliva which is why it’s referred to oftentimes as the “kissing virus.” Of course, there are other ways to come into contact with saliva so you should be wary of sharing drinks and toothbrushes, and taking a bite of another’s food. Mono can also be contracted through mucus, tears, blood transfusions, organ transplants, and sexual contact. It’s also possible to contract mono from a person who doesn’t seem to have it. The reason is that mono, once contracted, stays in the body forever and can reactivate at any time. 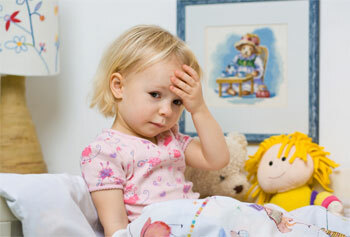 During the reactivation period, even if the person does not look sick, the virus can spread. The best way to avoid getting mono is to always wash your hands before you eat, after you use the bathroom, and after you sneeze or cough. Also, try not to share objects that have come into contact with someone’s mouth (easier for adults, tougher for children). A physical exam starts the process of diagnosing mono but, oftentimes, children and adults don’t exhibit the obvious symptoms. As a result, blood tests will follow and thus indicate if a person is currently infected with the Epstein-Barr virus or has had it in the past. Mono cannot be cured. It can only be managed. Because it’s a virus, antibiotics won’t work. There is no vaccine available for it, either. * please consult with your physician before taking any drug. How Do I Know If I Should Call My Doctor?